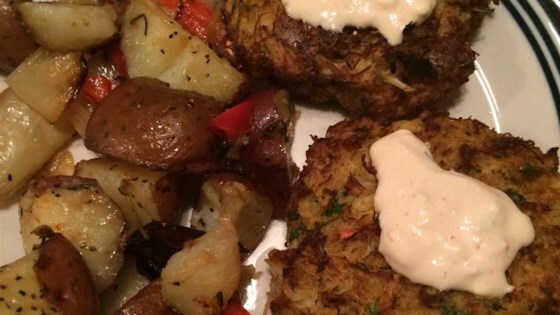 "A delicious creamy sauce for your crab cakes that's a breeze to make and tastes great." Combine the sour cream, mayonnaise, cottage cheese, salsa, cayenne pepper, lemon juice and yogurt in a blender and puree until smooth. Chill before serving. In just 99 seconds, we’ll show you how to throw an authentic crab boil! I found the yogurt to give a funny taste to the sauce. I may substitute for the yogurt next time. everyone loved this sauce. People were taking so much you couldn't see their crab cake underneath it. It was a huge hit. This sauce is so easy to make and wonderful to taste. It keeps well in a covered jar. I didn't use the cottage cheese, but added a bit more cayenne pepper and a dash of hot sauce, biy was it yummy!! This wouldn't be my favorite recipe for sauce. I sub'd the salsa with horse radish as another reviewer suggested. It was good but not outstanding.